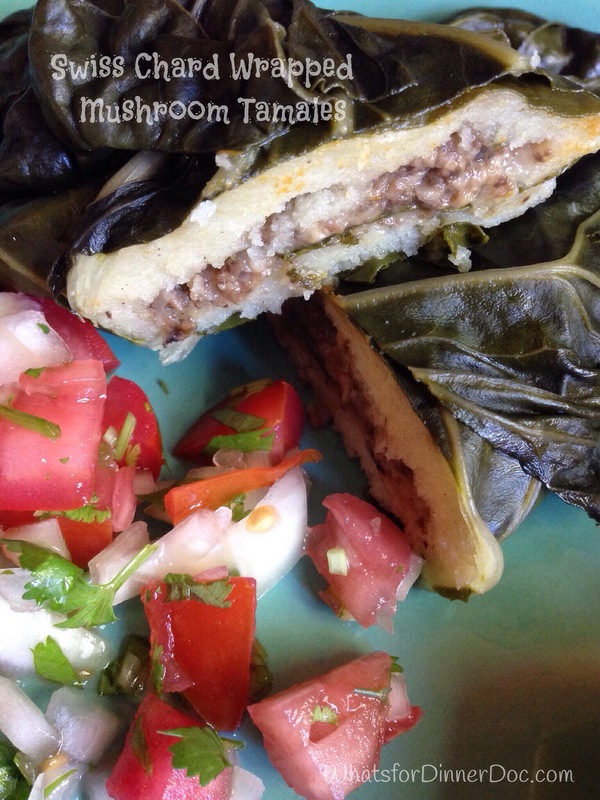 Swiss Chard Wrapped Vegetarian Mushroom Tamales, La Gringa Original Recipe – What's for dinner, Doc? You know how we foodies stumble around the Internet looking at recipes and Googling ingredients and we are struck by a lightening bolt of inspiration? No? Maybe that’s just me but stay with me because I have created a major Baja inspired vegetarian tamale that even a seasoned Mexicana abuela might love. 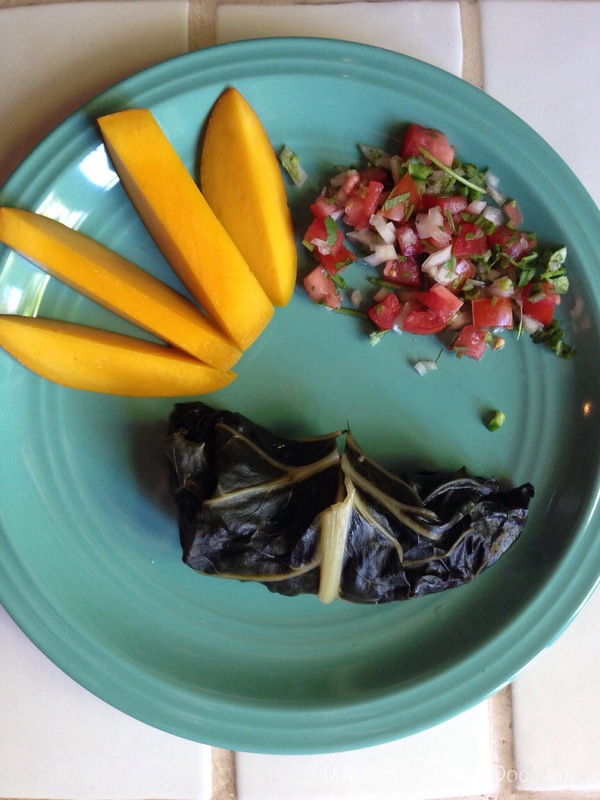 I saw a post that used chard as a wrap for masa dough instead of corn husks and nothing else. “Why bother,” I thought “That’s too boring.” Then I thought mushrooms are a good meat substitute, so I stumbled around looking at mushroom fillings for ravioli because who doesn’t love mushroom ravioli? Right? And then…… I know it’s a long story. 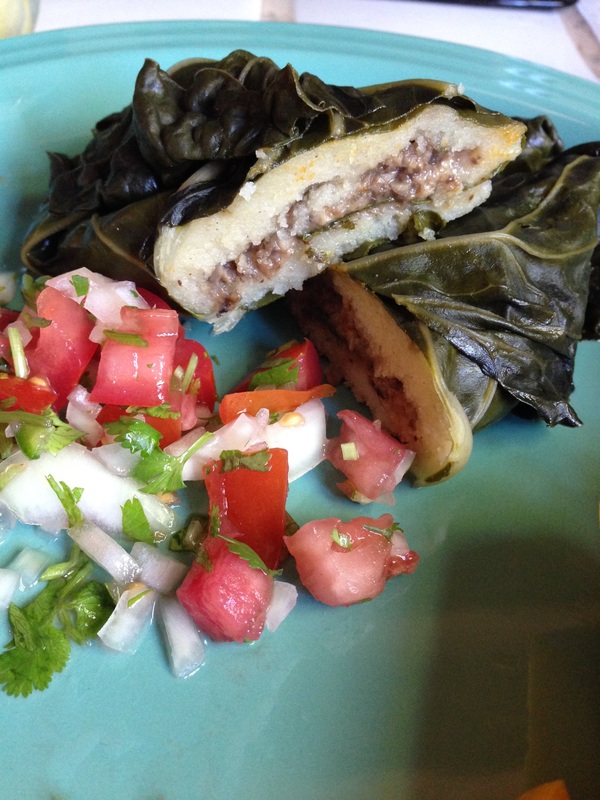 I made vegan masa dough with olive oil, made mushroom/ Parmesan cheese filling and wrapped it in Swiss chard leaves instead of dusty corn hulks. (Corn husks here always look dusty to me, probably because they are.) A recipe was born and the results were devoured. I’m hoping mi amigas at Fiesta Friday enjoy tamales. The co-hosts this week are Elaine and Jhuls, two of my favorite foodies. Difficulty: Easy but time consuming. 2 cups Masa flour, not corn meal. You can buy masa dough but it is usually made with lard. Finely chop onion and garlic. Sauté in olive oil until translucent. Finely chop mushrooms, I used a food processor. Add mushrooms, herbs, dash of salt, black pepper and wine. Sauté on medium heat until most of the water evaporates. Stir in Parmesan cheese. Process mushroom mixture in the food processor until paste like. Mix masa ingredients with a spoon or by hand, adding water 1/2 cup at a time until dough is soft like thick frosting. Pat dry the chard leaves. Remove stalk and cut 3 inches of tough stem from the remaining leaves. Place 2 tablespoons of masa dough on the top 1/3 of the chard leaf and pat down with your hand. Top with 2 tablespoons of mushroom mixture. Roll chard leave over masa and mushrooms, pulling in the sides and securing with a toothpick, making an envelope. Steam in a steamer basket (I used a roasting pan with a rack.) for 60 minutes. Check your water level every 10 minutes. When cooked the masa will be firm and moist. Do they make tamales in the U.K.? I wonder if you can find masa flour. I haven’t tried tamale, but I bet it tastes superb knowing the ingredients are so lovely! Thank you for sharing at Fiesta Friday party! Have a lovely weekend!